ORLANDO, FL (August 31, 2010) – Eighteen Florida companies representing 12 counties will receive 2010 Governor’s Business Diversification Awards for exceptional contributions they made last year toward statewide economic diversification. The award recognizes successful job creation and distinctive community involvement and investment efforts, many of which fall into industries Floridatargets for economic diversification and high wage job growth: aviation/aerospace, cleantech, financial/professional services, homeland security/defense, information technology, life sciences and manufacturing. Eighty-five companies competed this year. The awards will be presented September 22 in Tallahassee during Florida’s annual Industry Appreciation Week (the third week of September). Business Expansion – companies that expanded operations in 2009, investing capital and creating jobs for Floridians. Entrepreneurship – start-up companies (less than 5 years old) that have set a standard for entrepreneurship and creativity. Export Excellence –companies with a significant increase in documented export sales in 2009. Innovation – companies, organizations or institutions that through product or process best exemplified innovative leadership in 2009. Newcomer – For new-to-Florida companies that began operating in 2009. Green-to-Gold – Florida companies, universities or other organizations that through product or process best exemplified “green” leadership as it pertains to the state’s goal to become a leader in this emerging field. For award consideration, a business can self-nominate or a local economic development organization can submit a company. Each competes with other companies, organizations, universities and colleges in similar sized markets in categories includingMid Market (county population up to 150,000); Major Market (county population 150,001 to 800,000) and Mega Market (county population 800,001 and higher). Here’s a breakdown of the winners by county. Enterprise Florida, Inc. is a partnership between Florida‘s business and government leaders and is the principal economic development organization for the state of Florida. Headquartered in Orlando, EnterpriseFlorida’s mission is to diversify Florida’s economy and create better-paying jobs for its citizens by supporting, attracting and helping to create businesses in innovative, high-growth industries. In pursuit of its mission, Enterprise Floridaworks closely with a statewide network of economic development partners and is funded both by the State of Floridaand by private-sector businesses. STUART, FL (August 31, 2010) – The Business Development Board of Martin County (BCBMC) today received word that four (4) Martin Countycompanies are recipients of the 2010 Governor’s Business Diversification Awards, a statewide program that recognizes Floridacompanies in emerging and high-technology industries for their contributions to Florida’s economic growth. Coordinated by Enterprise Florida, the awards presentation is held by the Governor annually during Florida’s Industry Appreciation Week (September 20-24, 2010) in Tallahassee. The 2010 winners of Governor’s Business Diversification Awards from Martin County are UCT Coatings, Inc. in the Innovation category; Level 3 Inspection, LLC in the Entrepreneurship category; Gulfstream Aluminum and Shutter Corporation in the Export Excellence category; and Liberator Medical Supply, Inc. in the Business Expansion category. Companies that vied for the Governor’s Business Diversification Awards competed with other companies, organizations, universities and colleges in markets similar to their own size. The market classifications were: Mid Market (county population up to 75,000); Major Market (county population 75,001 to 750,000); and Mega Market (county population 750,001 and higher). Martin County was the only county in the state to have four award winners. This is the third consecutive year that Martin Countyhad more award winners than any other county in Floridaand the fourth consecutive year that Martin County companies received awards. In 2007, Elliott Energy MicroTurbines, now Calnetix Power Solutions, received the Governor’s Business Diversification Award in Export Excellence. In 2008, Sol, Inc. (Export Excellence); Advanced Technologies Group, Inc. (Innovation); and Ecosphere Technologies, Inc. (Green-To- Gold) received Governor’s awards in the noted categories. Winners for 2009 were Waterblasting Technologies, Inc. (Export Excellence); SystemsOne, LLC (Entrepreneurship); Seatorque Control Systems, LLC (Business Innovation); and CSA International, Inc. (Green-To-Gold). Governor Charlie Crist designated the week of September 20-24 as Business Appreciation Week. As part of the celebration, the BDBMC will host a luncheon on September 24 that will recognize the many contributions of local, existing companies from within targeted industry sectors. These companies provide quality jobs, help expand the local tax base and help drive positive economic activity in virtually all sectors of our local economy. The Business Development Board of Martin County is the county’s official economic development organization, and Enterprise Florida, Inc. partner. More information about the organization can be found by visiting www.bdbmc.org. Enterprise Florida, Inc. (EFI) is a partnership between Florida’s business and government leaders and is the principal economic development organization for the state of Florida. Headquartered in Orlando, EFI’s mission is to diversify Florida’s economy and create better-paying jobs for its citizens by supporting, attracting and helping to create businesses in innovative, high-growth industries. In pursuit of its mission, EFI works closely with a statewide network of economic development partners and is funded both by the State of Florida and by privatesector businesses. More, better, faster is probably the mantra of every manufacturer, especially as it applies to quality inspection. Level 3 Inspection has found a solution to the more-faster-better inspection dilemma. The company has implemented a SmartFAI process that combines White Light Scanning (WLS) with computer-aided-inspection (CAI). The combination gives Level 3 the ability to perform more comprehensive inspections on parts in a shorter amount of time. The SmartFAI First Article Inspection (FAI) process involves verifying every feature on the part by comparing it to a customer-supplied part print and 3D CAD model. First-article inspections are done prior to full production release and often while a part is in development. The Level 3 approach replaces traditional plate inspection or a CMM system with WLS, which can capture and calculate precise 3D coordinates for millions of points in seconds. CMM captures only a few points in the time that WLS can capture hundreds of thousands, so Level 3 is able to do a more thorough inspection. The results are much more visual and therefore much more easily understood and interpreted. 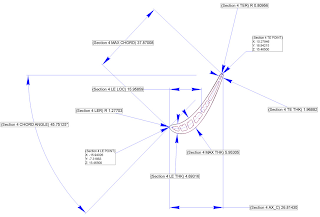 Turbine blade inspection poses some unique challenges, such as analyzing the twist of a newly manufactured blade compared to the CAD model. This is difficult using a CMM system, which depends on the operator to accurately capture the points that will show whether or not the blade is twisted within the allowable tolerance. Often, there is not enough point data to make an accurate comparison. Level 3 Inspection has the ability to automate twist analysis. Level 3 can align a cross-section of the scanned model to reference data, and automatically generate statistics on the twist of the blade. Constraints can be placed on maximum rotation and twist tolerance. 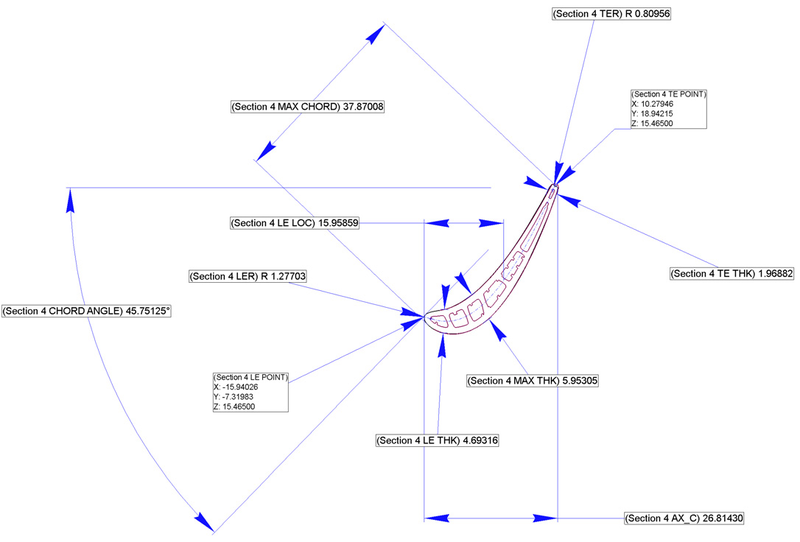 Level 3 also provides graphical inspection for turbine blade properties such as mean camber line; max thickness; LE and TE radius; thickness at offsets from the blade ends; wall thickness and chord length. Level 3 Inspection’s customers are moving quickly to statistically based inspections in which the qualification is based not on a single piece, but on a sampling of parts, new part inspection would take much longer to complete without the ability to automate portions of the process. 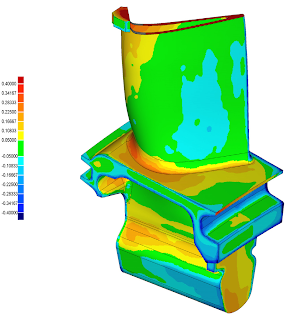 Traditionally, studies based on a sampling of parts are done using CMM to generate metrics on dimensions for each part. This is a time-consuming process, since each part must be measured individually. Data is then typically transferred to an analytic program, evaluated, then published. Level 3 is replacing the CMM-based process with automated trend analysis. Once a part is scanned and a report is saved, Level 3 can automatically generate portions of the capability studies defined by their customer or OEM specifications. Batch processing enables Level 3 to collect data and generate reports on a large number of parts. Statistical analysis tools allow Level 3 to compare parts for pre-defined factors such as repeatability, changes over time, and variations from part to part. Speed is the key. Speed of inspection is always Level 3 Inspection’s main challenge. Everyone wants the results yesterday and our process is helping us deliver more complete results much quicker.